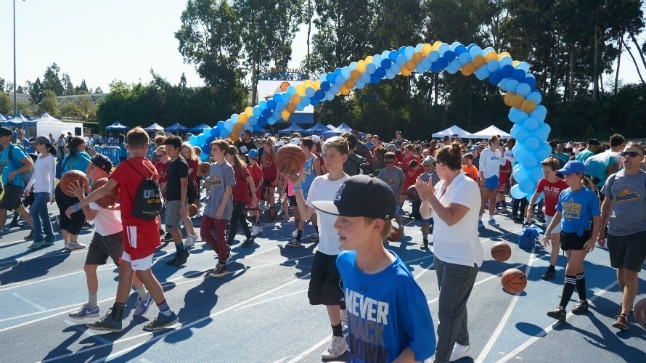 UCLA's 10th annual Dribble for the Cure event, a rally generating funds for the research and treatment of pediatric cancer, drew over 1,200 participants and $192,000 — a record on both counts compared to past years. Each year, participants gather on UCLA's campus and dribble basketballs alongside the UCLA men's and women's basketball teams. This year's rally — taking place Sunday, October 15 — began at Drake Stadium and concluded at Pauley Pavilion, where attendees got autographs and pictures with both Bruin basketball teams. Neil Everett of ESPN’s SportsCenter emceed the event. Since its inception, Dribble for the Cure at UCLA has raised nearly $1.5 million for the Pediatric Cancer Research Foundation and the cancer research program at UCLA Mattel Children's Hospital. 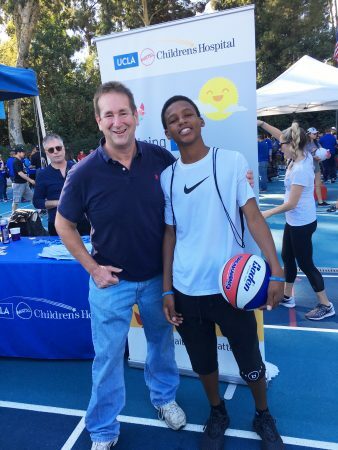 “I'm so thrilled with our record-breaking Dribble for the Cure fundraising,” said John Vallely, who brought the Pediatric Cancer Research Foundation's Dribble for the Cure event series to UCLA with his wife, Karen. Vallely, a former UCLA guard, is a UCLA Athletics Hall of Famer and started for John Wooden's NCAA championship men's basketball teams in 1969 and 1970. In 1992, he and Karen lost their 12-year-old daughter, Erin, to pediatric cancer. “The funds [from the event] go 100 percent toward research that allows our researchers to take a chance, to think outside the box, creating brand new ideas and to ask ‘how can we do things differently?'" said Dr. Theodore Moore, chief of pediatric hematology/oncology at the David Geffen School of Medicine at UCLA, in remarks to attendees. A number of patients from UCLA Mattel Children's Hospital served as honorary captains, helping to raise funds at the event. Kenny Thomas, 13, who was diagnosed with non-Hodgkin lymphoma in 2012 and is now in remission, was chosen to speak on behalf of the captains. "Kids like us are living proof of how important pediatric cancer research is,'' Thomas said. "Thanks to organizations like the Pediatric Cancer Research Foundation and the hard work they’re doing, survival rates are increasing, innovative treatments are being used, and earlier detection is possible. Lives are being saved."